There are five self catering cottages at Croan and these are available to our guests for week, weekend or midweek breaks throughout the year. 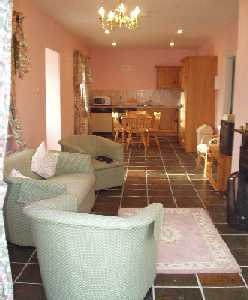 Croan Cottages are fully furnished three bedroom and two bedroom spacious detached holiday cottages. 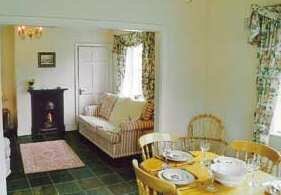 Each holiday home has an open fire, a private furnished patio and barbeque area. 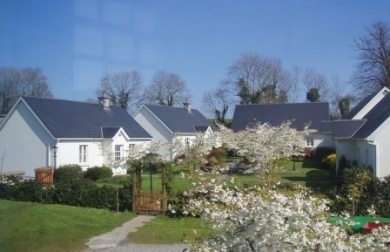 Although the cottages have a traditional style and are on an old estate, they were built recently and have been furnished to an exceptionally high standard, having Failte Ireland's (Irish Tourist Board) highest rating of four stars. All of our cottages are designated as 'No Smoking'. Smoking is permittted outside. Pets are permitted to stay with their owners in some of our cottages. Every cottage has Satellite TV and a DVD player. What is "self catering" accommodation? For those unfamiliar with the term, a description of what self catering means is provided on our What is self catering? page. 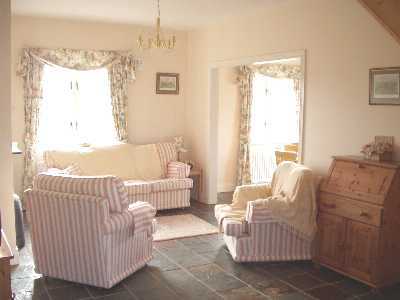 The living room in Beech Cottage (2 bedrooms). Each 2 bedroom cottage has one double bedroom and one twin bedroom as well as a bathroom (with bath and power shower), a living room (with open fire) and a kitchen and dining area. 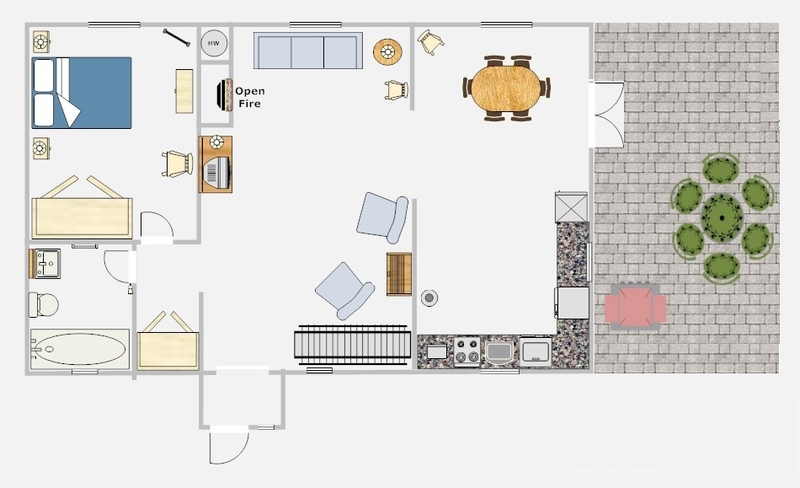 Please click on the image above if you would like to see a larger copy of the floor plan of the cottage. 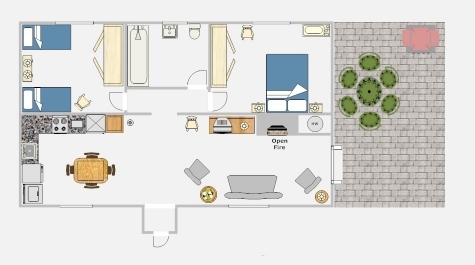 Each 3 bedroom cottage has one double bedroom and two twin bedrooms as well as two bathrooms (one with bath & one with power shower), a large kitchen, dining room and living room (with open fire). 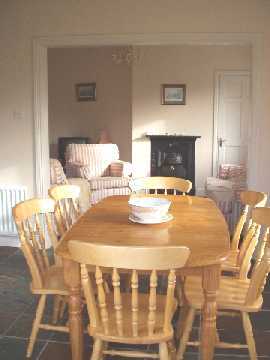 View of the living room from the dining room of the 3 bed holiday home. Here at Croan, we want to make your holiday as relaxing as possible and for many of you, that might include a break from cooking! 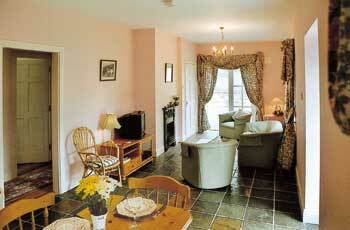 Further details are available on our Croan Cottages Cuisine page. 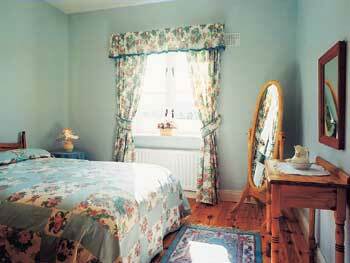 All of our self catering cottages are fully furnished and equipped with everything you need for a relaxing holiday. 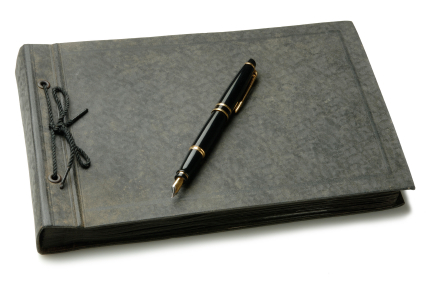 Read what some of our recent guests have said about Croan Cottages or sign our guest book! Croan cottages boast all the mod cons one could expect from four star self catering accommodation, including fully fitted kitchen with dishwasher, washer/dryer, fridge/freezer, cooker, microwave, TV, WiFi and central heating. Each cottage has an open fire in the lounge for Autumn or Winter evenings and direct access to private patio and barbeque area for al fresco dining and lazy summer evenings. The kitchen has all of the appliances and implements that you might require during your stay. Well behaved Pets are welcome to stay in the cottages. 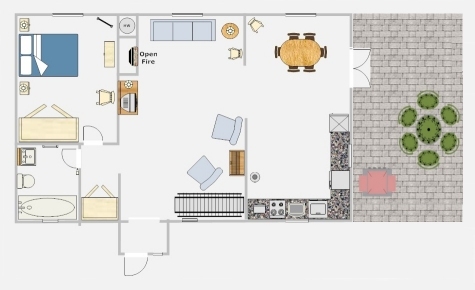 The living room of a 2 bedroom cottage. 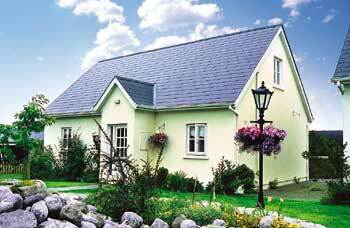 We feel that Croan cottages are an excellent base for a self-catering holiday in the Southeast of Ireland. We also have a selection of board games and video games that our guests can borrow. 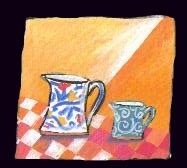 Each of our holiday cottages is decorated with pieces of handmade and handpainted Pottery from The Bridge Pottery. Our friend Mark at the Bridge Pottery has created some beautiful pieces of pottery which we have on display in the cottages. The pieces range from Jugs and Bowls to Clocks and Wall hangings. All of these pieces are available for you to take away as a gift for a friend or for your own home. Mark also have a huge selection of his art in the Pottery Gallery in Burnchurch (approx. 20 minutes away from Croan by car). 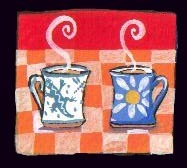 Our friend, the illustrator Cathy Dineen, has designed an excellent postcard image for us. 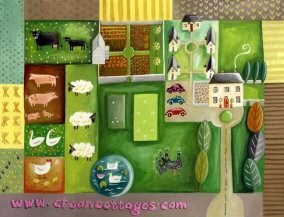 We have put the postcards in each of the cottages so that our guests can send them home to family and friends. If you would like some, just drop us an email with your name and address and we would be happy to send some on to you. 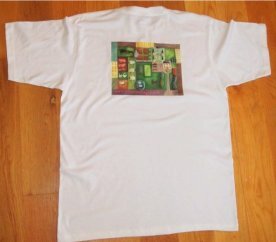 Cathy's painting of Croan was so good we also had it printed on some T-shirts and these are now available to buy. The shirts are available in a variety of sizes and cost €15 each. Mail order is also available. Croan cottages has been grant aided by Barrow Nore Suir Rural Development through the Leader Programme. Wondering about when to visit? We have some information on the Irish Climate and weather here.